Puttenahalli lake is among the best examples of lake rejuvination projects in Bangalore, a civic initiative supported by authorities. Civic bodies in the city have a long way to go in rejuvenating the lakes, most of which are virtually dying, in the city. Bruhat Bengaluru Mahanagara Palike (BBMP) and Bangalore Development Authority (BDA) are spending crores of rupees to develop the lakes, however ,their efforts are too little. About 140 lakes are still crying for immediate action for rejuvenation as the city is heading for a disaster in terms of meeting its water needs. The state government had identified 183 lakes in the city limits for rejuvenation. But BBMP and BDA managed to develop not even half the lakes coming under city limits. In the last three years, the BBMP spent `62.45 crore to develop 19 lakes.The state government had asked the BDA to develop the remaining 123 lakes in a phased manner. In the first phase, the BDA developed 12 lakes spread over a total area of 766.33 acres. In the second and third phase, 32 and 78 lakes measuring over 4200 acres will be taken up for rejuvenation. On the other hand, in the last three years , BBMP has spent `62.45 crore to develop 19 lakes. 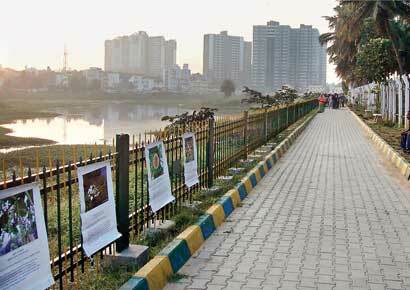 Major portion of the money was spent to develop Yelahanka lake measuring over 290 acres. Across the state, through minor irrigation department, the government has developed 4248 lakes. Majority of the developmental have works have been taken up in the financial 2011-12 and 2012-13.